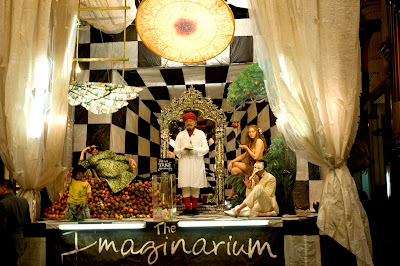 The Imaginarium of Dr. Parnassus is a must-see movie in every sense. Is it great? Not really, but like most Gilliam movies, it's an experience. And a profoundly personal experience this time, because Parnassus is actually an autobiographical tale. The plot is quite convoluted, so I will not attempt to make any coherent summarization. 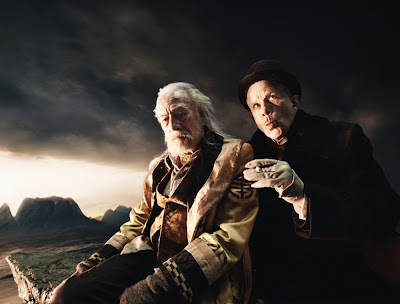 Let's just say that Dr. Parnassus (Christopher Plummer) is actually Terry Gilliam, who is trying to tell tales of imagination, but nobody really cares anymore. Also starring is Heath Ledger as Tony in his last role, who actually isn't the lead, in a role inspired by Tony Blair himself. Great support comes from Tom Waitts as the Devil, as well as Lilly Cole as Parnassus' daughter. The three actors replacing Ledger posthumously (Johnny Depp, Jude Law, and Colin Farell) all do a terrific job at portraying different aspects of Tony's character, with Johny Depp delivering a terrific speech written about Ledger's passing, and Farell shining as the darkest aspect of Tony's character. Personally I think the inclusion of the three actors has really improved the movie's thematic core. Thanks for your review. I just wanted to add that Johnny Depp's speech was in the original script. It is obviously eeriely prophetic, on account of Ledger's death. There is certain genre of movies(if you can call it that) that deal usually with a girls' adventures in a fantasy land/enviroment. Tideland, Masked Miror and Labyrinth are some of its representatives. Even though these movies are different from each other they all share some characteristics. These characteristics are boring for me. The absense of a coherent script and in its place a ride from one setting to the other for the sake of it, is boring and the visual novelty goes away quickly. So the movie has to hold on to something to be intersting for me. In labyrinth was its humor, in tideland was the sick mind of Gilliam and in Masked Mirror..well nothing...it sucked. If in Imaginarium we are thrown into some visually interesting, well scripted, well acted, sick giliam ride I am in!